These 16 ounce jars are the perfect size. And later they will replace all of our drinking glasses because our drinking glasses were bought on sale and are not holding up well. 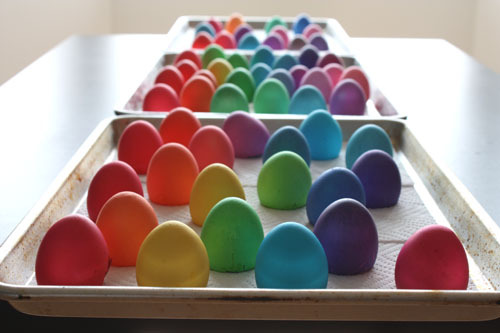 Note: All of the eggs shown here are eggshells that were emptied before they were dyed, meant to be turned into Easter Surprise Eggs. I don’t know if you’d get the same color results from a hard boiled egg, but I doubt you’d want to eat a hard boiled egg after it’s been introduced to this much food coloring. Also note: The color amounts are subject to change because I’m still not quite happy with all of them and I didn’t yet have a chance to test dye everything one more time. Because if I did take the time to do that this wouldn’t get posted until Halloween. 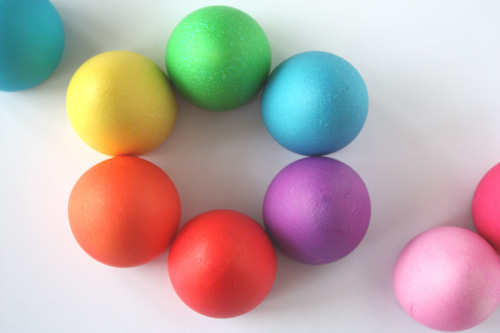 The color on the eggshell will deepen as it dries, so don’t despair if it isn’t as saturated as you’d hoped when you first pull it out of the dye. The teal and the dark pink eggs were the consistent best and both of those colors worked perfectly almost from the very start. Reds and oranges turned out well, blues and purples were the most difficult to get right and tended to be the most blotchy or streaky. 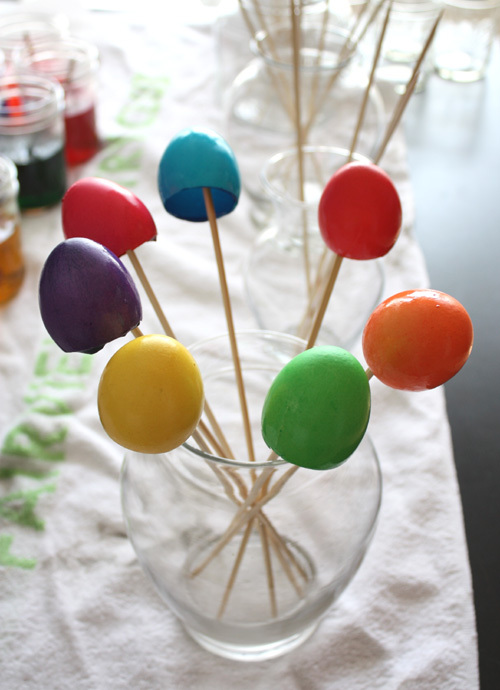 When using emptied eggshells like these stirrers or skewers are really the best way to lift the egg, a spoon will prove a lot more tricky. The colors will look very different under artificial lights, the neon colors will show a lot more and the reds will seem much more orange. It’s fascinating. I have one more thing to add to my list of why jars are ideal. I went from soaking the eggs for 10 minutes to 25 minutes because the eggs I accidentally left too long turned out better. Um, those charts have been on the box for as long as I can recall. 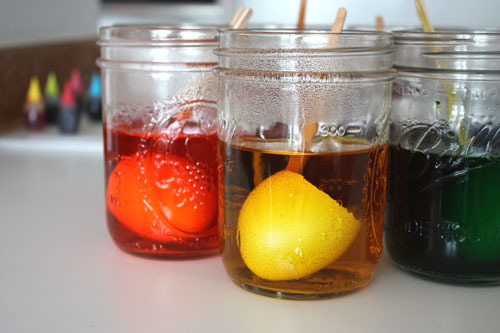 I have always used the food coloring for our egg dyeing. We never got such saturated colors though, so I appreciate your research! Well that figures! Next year I’ll have to do a dye-off. And what did you make with all the eggs that came out of all those stunning shells? Dianne – I would use them to make surprise eggs or cascarones, but this time around I was too late to put them to good use. My intention was to get the colors just right because I never liked the purple from my original Surprise Egg project and years later it was still bugging me! Didn’t quite work (at ALL) but I decided to embrace the speckled look. And yeah, we did it today… it was a busy weekend. Ailidh – Is that your website? If so, were you going for an ombre look? Google Translate gives me generic text and I have no idea where this idea came from or how it was done. Let me know if you have any further resources, I’d love to attempt to recreate these! 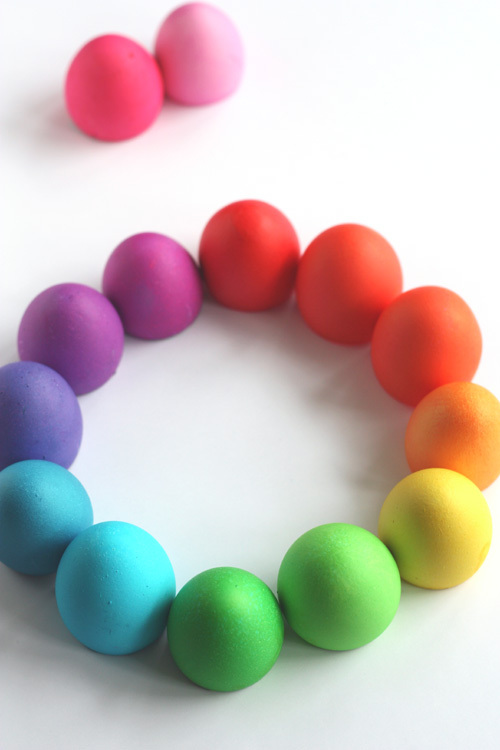 When I dyed eggs this year I had a problem I’d never had before. The dye is coming off! Aagh! Have you ever had this problem? I used the dye my family grew up using (generic store brand). This is the first time it has happened. Any advice? 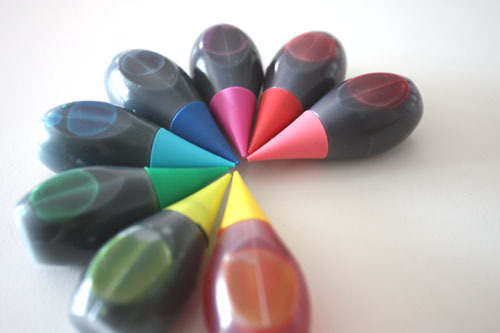 MaryElaine – I have not quite had this happen, do you mean the color came off after it was dry? I’ve had the color come out botchy if I agitated the eggs too much (and by that I mean a bit obsessively) while they were in the dye. Yeah for brilliant colors!!!!! And though I’ve been to this site many a time, I didn’t notice you’re from Seattle! (Me too.) Yeah for Seattle bloggers! I have been using your last egg dyeing post for the past several years. We use hard boiled eggs and eat them. We are all still alive and well. I also use your dye recipes for icing. People are always amazed by the bright colors. NOLALeBlanc – Why thanks! Using the same combinations for icing is a really smart idea!